A.) X meets X in this thrilling novel! B.) Fans of X book/author will enjoy this novel! C.) Fans of X genre will love this! D.) -- tells this story with the grace of X author etc. etc. And how many of how have been annoyed by these comparisons? It's no secret that when you compare a book to the Hunger Games, the book is supposed to be an epic dystopian novel. A lot of people look for those kind of comparisons, look for a novel that will replicate the awesome feeling they got from their favorite book, and publishers of course would like to exploit that. I believe Harbinger by Sara Wilson Etienne was marketed as Girl, Interrupted meets Beautiful Creatures. I like how that tells you a few things to expect: gothic elements, paranormal, instant connection. I recently read Born Wicked by Jessica Spotswood. 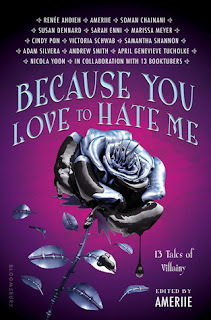 If you didn't already know, that book was marketed as A Great and Terrible Beauty meets Cassandra Clare, and those are some pretty hefty comparisons to make. I like both Libba Bray and Cassandra Clare's writing styles, I even like Jessica Spotswood's writing, but they don't compare to one another. The only similarity I could find between Born Wicked and A Great and Terrible Beauty was the repressive society / time period feel. Reading Born Wicked, however, I couldn't help but feel disappointed. It wasn't the book's fault. It was that I had had such great expectations of it after that comparison that I felt like no matter what I ended up reading, it wasn't going to be as great as I had pictured. It was a good book, and good on its own, and I think that without that comparison, I would've enjoyed the novel more. 2. Why can't the book hold its own weight? Why do you a need a comparison to other books anyways? Can't you convey theme and plot and who would like the book without looking to other books? You also have author blurbs--they're supposed to tell you the fans of whom the publishers think will like the book. Besides, the books that make it to the top always seem to hold their own weight; they're the ones that didn't have the comparisons like "Fans of The Hunger Games will love this" (in my opinion at least). This goes along with what I've already said, but in making comparisons, publishers are always reaching higher and higher, aspiring to reach the level of excitement that another hyped book got. And that takes away attention from the book itself and gives it to another "classic." It has gotten to the point where I don't trust comparisons to The Hunger Games anymore. What do you guys think? Are you a fan of comparisons? Do they make you more or less likely to buy/read a book? This is a really interesting post. I can see why, from a marketing perspective, they use these comparisons and sometimes from a reader perspective they're useful too. It's good to know that if you read X book you'll probably like Y book too. MY issue is when they draw comparisons between books that have NOTHING IN COMMON with each other. Prime example, my Soul Screamers books say "Twilight fans will love it" WHAT have the Soul Screamers books got in common with Twilight??? I agree with Cait's point about getting frustrated when two books don't match up. On the other hand, I'm all about comparisons/companion novels/pairings. I studied this my last semester of college and I'm always looking for YA companion novels that will especially go with the canon literature that is commonly taught in schools. It's also great when a student comes up to you saying I loved X, but I don't know what to read next; can you suggest something similar? I wouldn't be so annoyed by such comparisons if they were true at least in some instances. What usually happens is that some extremely mediocre books gets compared to a runaway bestseller. There is a blurb of "The Selection" which claims it be an HG and Bachelor cross. How is this even making sense? It is more beneficial, IMO, if a book's blurb gives some general information about genre, intensity of romance, etc. One of my biggest issues with this technique is that I often don't like the bestselling book the new book is being compared to. I disliked Twilight, so all that comparison is telling me is that I SHOULDN'T buy the book. I am also turned off by quotes from authors whose work I dislike saying, "This is the best book ever!" If I don't like what they write, I don't feel I can trust their opinion of what constitutes good literature.